I am frequently wrong and don't mind admitting it. I also change my mind and adapt to new information and developing situations. You strike me as being fairly inflexible and rarely wrong. But I am not insulting you; I am mocking you. I do this because you are high-handed and snooty. You're the one who took issue with me, for what, I don't know (truth be told I am an avian fan). (Actually, I do know; it's because I won't countenance a conflict with Turkey [at least at this time] because it would be a tactical mistake). The action you propose (bombing the rebels regardless of Turkey) would have ignored Turkey's view and put Turkey in the firing line. You are being inconsistent (though consistently vague). This action would have seriously damaged the (developing) relationship between Russia and Turkey (which is more than just about Syria). You might say that Russia shouldn't care about their relationship with Turkey, but look at any map and you would see (if both your eyes were placed to the front of your head) that Russia has to care. Again you show no sign of understanding my point that Russia won't (can't) get into a conflict with Turkey. Russia won't ride roughshod over Turkey views. Russia has never just 'bombed' the rebels mindlessly. It was always been tactical. Russia also does not have magic bombs that can avoid hitting Turks. Syria is actually already partitioned and has been for sometime. It is just not legally (internationally) recognised, as such, and probably never will be. There have already been huge costs in recovering Syrian land and there are likely to be even more huge costs to be incurred. 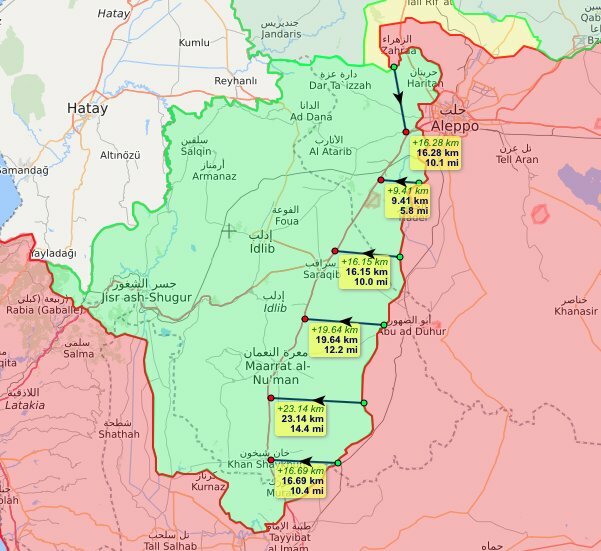 Concessions for Idlib might well be necessary and might well be less costly that war. But that discussion is premature. The US occupation is a different thing entirely and will probably not be amenable to such concessions. Implicit in your comments is the idea that Russia can take on Turkey and the US (and presumably France, UK and Israel too) all at the same time with one-hand tied behind there back. Any fool can see that this is just not possible. So take your disagreements there. I won't be back here. Since you are quite willing to accept the outcome of a partitioned Syria any further discussion would be pointless. You might as well come clean and openly support the "Assad must go" camp, because that is part of the concessions Syria would have to give to the occupiers. President Putin seems to be twisting Erdogan's arm to carry out part of the de-escalation tasks he committed himself to ages ago but did nothing. It seems to be a way of reducing the size of the terrorist enclave, releasing (hopefully large) numbers of civilians from terrorist control, and forcing Turkey to take action against the terrorists. For the sake of argument let's assume for a moment that Turkey and Russia are able to set up the agreed de-escalation zone. The area of the zone is quite large, a little under a third of the total area of the terrorist enclave. What is the population of this area? There appear to be no major cities in the middle, but Khan Sheikhoun, Maarrat al Numan and Saraqib on the edge, possibly included - logically the aim must be to include them. Even Idlib city is not far away, maybe 8 km. 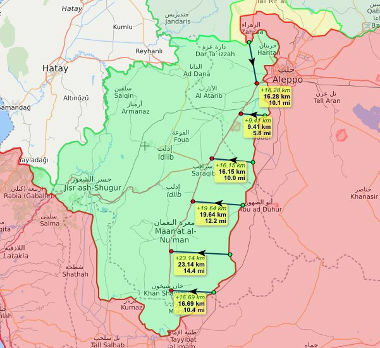 The de-escalation zone is to be patrolled by both Turkish and Russian forces, therefore - assuming for the moment that the proposed situation is achieved - this gives an automatic guaranteed escape route for many civilians, probably including those three cities. For other civilians further into the enclave, potential liberation is also that much closer. Perhaps some civilians from deeper within the enclave might be able to move into the proposed de-escalation zone in advance, so that they will be liberated. 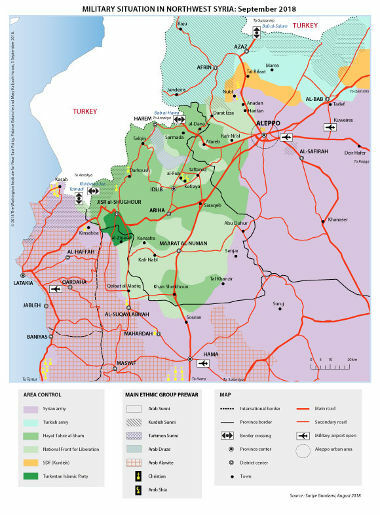 Perhaps Russia could later push for further de-escalation zones going closer and closer to the Turkish border, until the terrorist enclave no longer exists (or is inside Turkey)? The Syrian army and Iranian forces can sit back and watch the show. Russian forces will be facing real dangers, though. It all depends on what Ergodan's intentions are. If he wants to keep Idlib he will make some failed attempts at pacifying the Jihadis while the Jihadi's actually grow in strength. Then on December 15th he will plead for more time, claiming that his new plan will surely work. USA will back this new plan and (again) claim that Assad plans a CW attack. @105 jr.. that is basically how i read it too, although a lot can happen from here to december and it generally doesn't favour turkey..